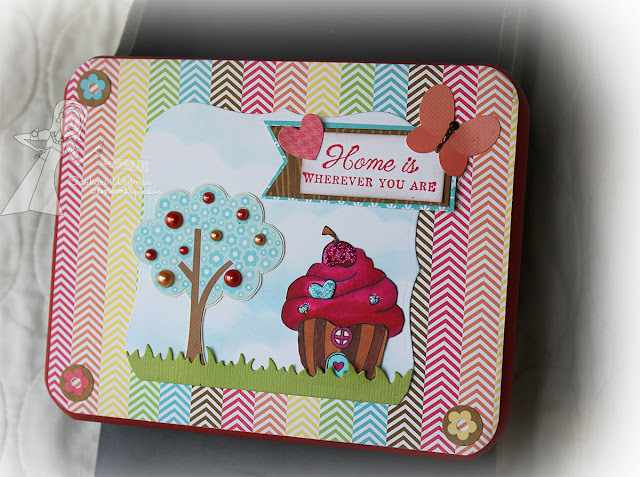 To alter my project, I used the Flower Box papers from Doodlebug - SOO full of awesome bright colors, patterns and an awesome sticker sheet! I used these bright and cheery colors and started altering my mail organizer by measuring the area of the front of each of the slots - from which I cut the patterned paper (I love the blue woodgrain pattern and the fun rainbow pattern) I cut them out and then glued them onto the fronts of each of the mail pockets. 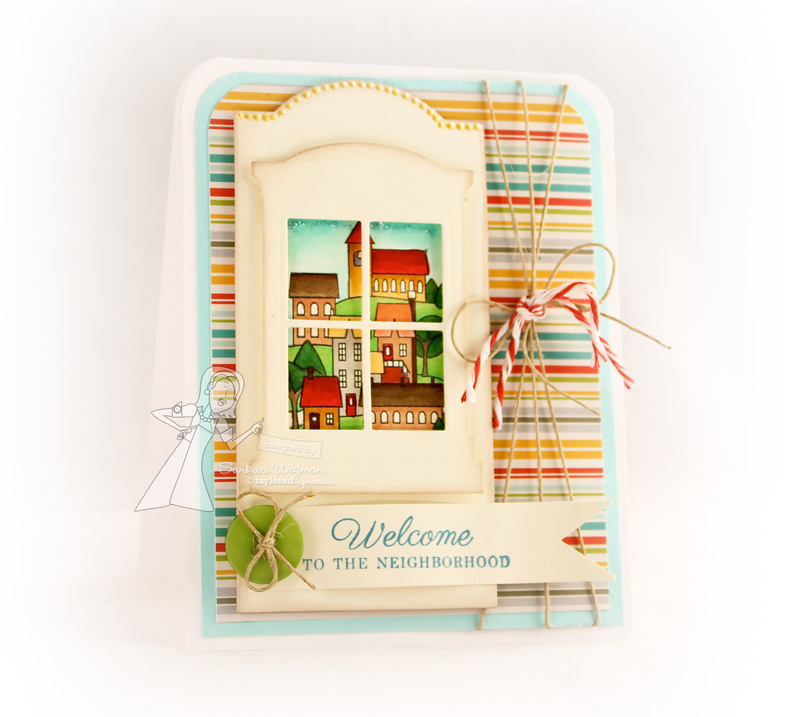 Accessories: Brads and pearls from the Doodlebug Flower Box Kit, Clouds Border die and Grass Border die from Taylored Expressions, Spellbinders nesties, sponger, Best Glue Ever, Bakers Twine, buttons from stash and Banner Stacklets 1 dies from Taylored Expressions. 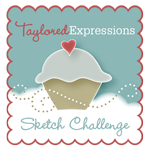 I love that Doodlebug and Taylored Expressions have paired up for this partnership! 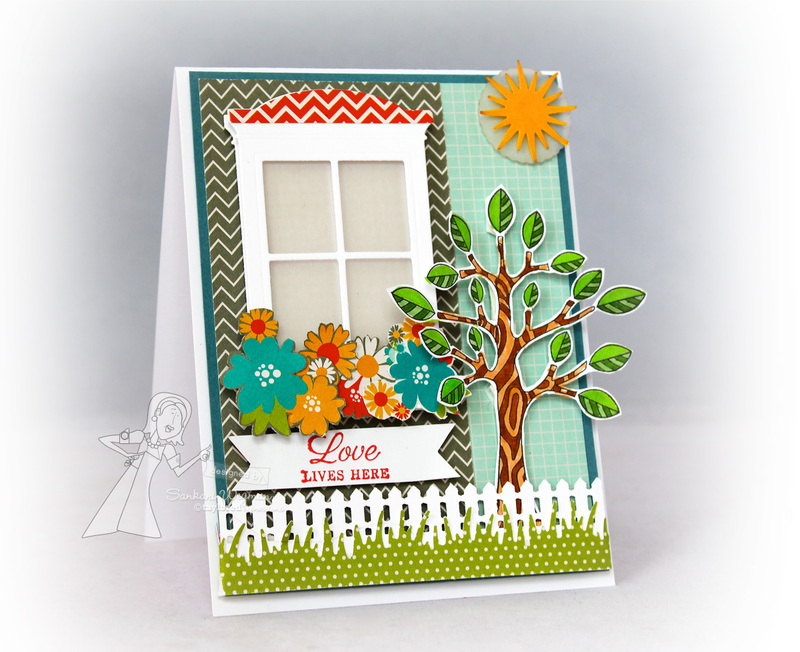 The fun and bright cheery colors and whimsical patterns of Doodlebugare such a great fit with all of the Taylored Expressions stamps! I had so much fun crafting and creating this project with the products from both of these awesome companies! 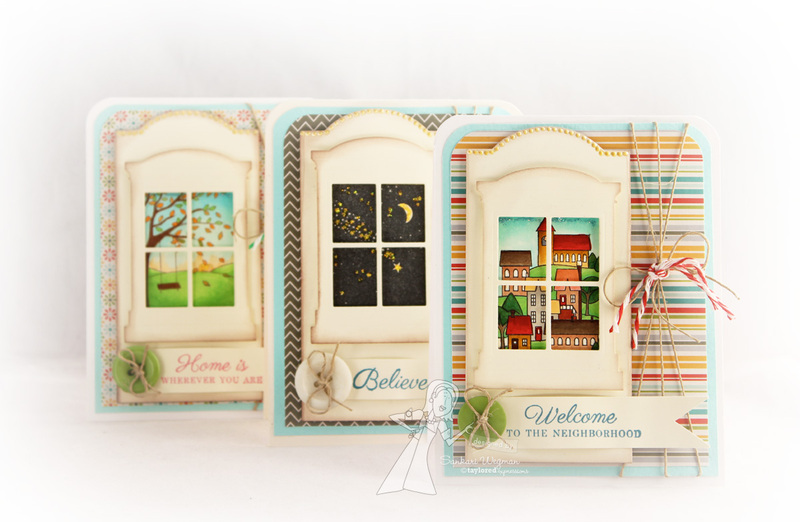 Later this week, Taylor will be showing the projects that the Baker's Dozen have created with all the wonderful lines from Doodlebug - so make sure to stop by there this week and thank you for stopping by today! Since the theme of this month is photography, I thought that I would use the Oh Shoot! 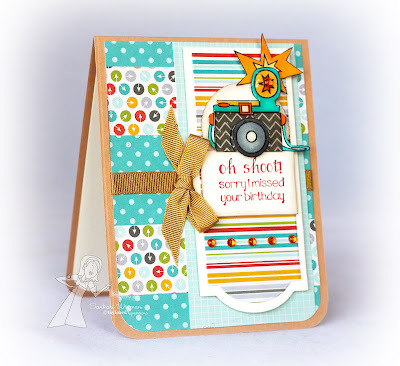 stamp set for my card today :) Here is the card that I created using the sentiment: "Oh Shoot!, sorry I missed your birthday!" 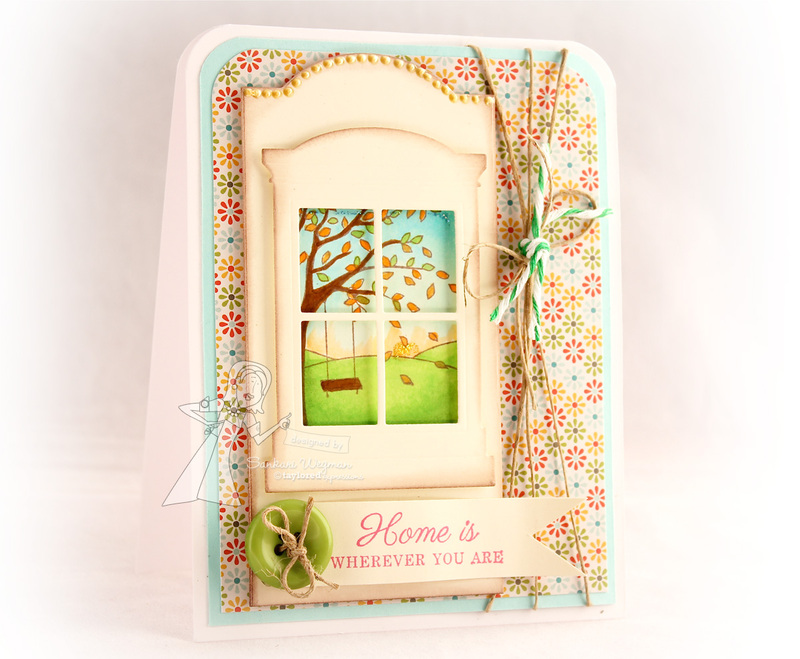 I love that sentiment as well as all of the others in this set! I am not a photography expert at all and I wish I had tips and tricks for how to take a good photo. 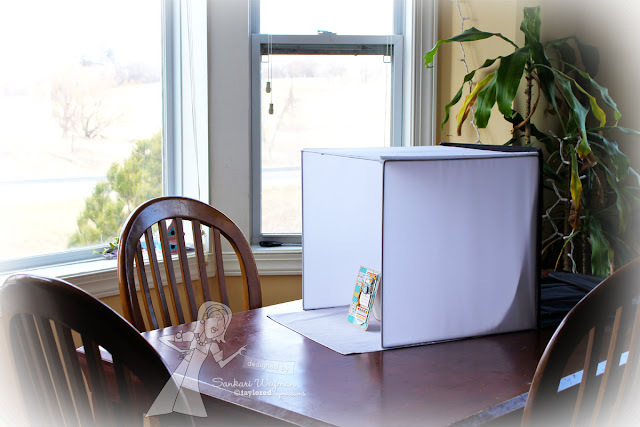 One post that really helped me was reading Amy Sheffer's post on SCS about the photography tips that she uses. I didn't follow the whole thing, but it really helped me get started. 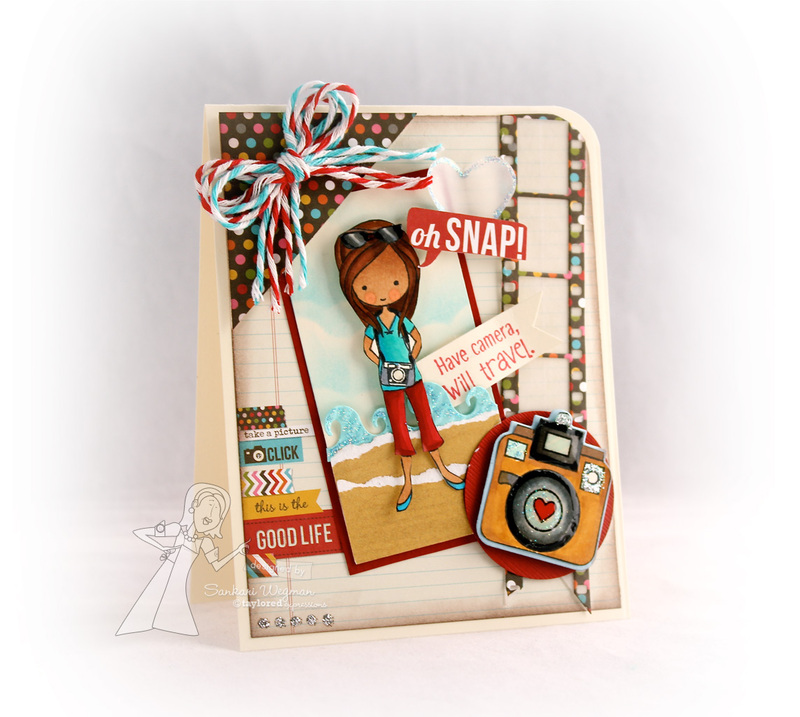 So I thought I would share what I do to take a pic of a card. First, here is a picture of my photography set up if I pull back from this card. The table is usually full of stuff that I typically just shove over to one side :) but for this picture, I actually wiped my table down - it usually has the remains of uneaten crusts, smears of jelly and almond butter and a ton of paperwork - Its so refreshing to see a clear table and also I am realizing that I need to water the plant in the corner :) !!! 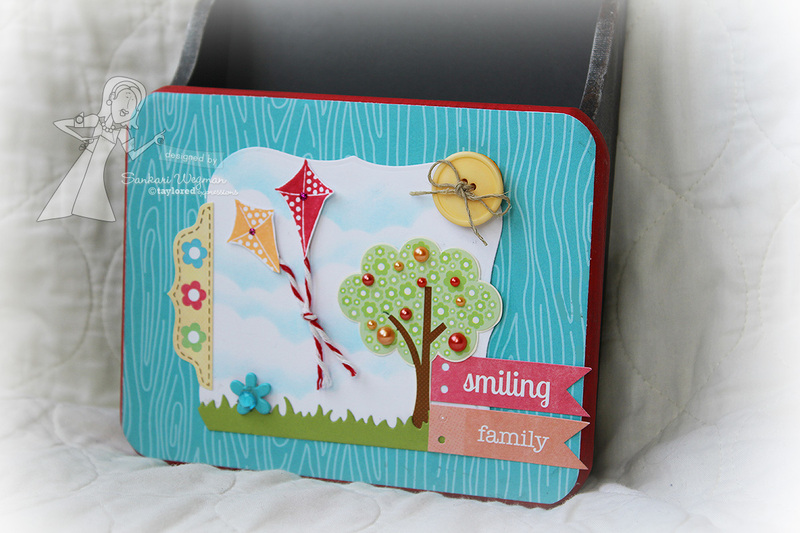 try angling your card to one side which allows the dimensions on your card to be seen - I like to angle my card to both sides take lots of pictures and then decide which one or which angled picture I like the best. this brings up the point: take lots of pictures - its nice to have options! Once the pictures have been taken, I upload my pics into my MAC (iPhoto) and see which ones that I like the best - I delete all the ones that I don't like and usually end up with three that I like the best - of which I see which one has the sharper image, is clearer etc. Then I open it up in Photoshop (I don't know which version I have, I think its a few years old). In photoshop, I change the image size (around a 4x6) and resolution of the pictures (to between 150 to 200 dpi). Next I like to create a little softness around my photo by using the modify feature in photoshop. I click on modify and the use the feather tool (about 90) and then select a box over the center part of my picture . One selected that portion of the picture will pulsate and then I click copy, click for a new file (which will be the same image size as the file I am copying from) and then making sure the background is white, I paste onto the new file and there is some feathering and softening to the edges of the photo. I might adjust the brightness of the picture also and might increase the saturation of the picture in case I was taking pictures on a cloudy day and there wasn't enough sunlight. Accessories: corner chimer, ribbon from stash, bling, glaze and Banner Stacklets 2 dies from Taylored Expressions. 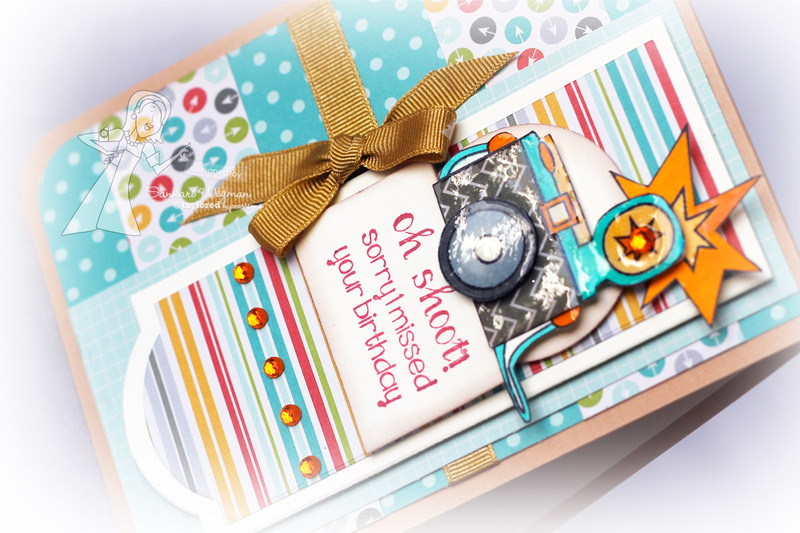 The Taylored Expressions Baker's Dozen Design Team have not only amazing designers but amazing photographers and I can't wait to see their tips and tricks for how the take their photos!! Please hop along with me and check them out! Hope your March has been a fun one! Here at our house - March has been flying by on super sonic speed! 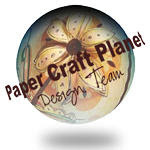 It might be a mix of cabin fever and spring fever and just plain old fevers that have made this a crazy month and any time I get a few moments to sneak to my craft corner I am so excited! Thanks so much for stopping by today! Hope you get some crafty time to yourself! And one of my favorite scenes from this set is the lovely tree with the swing on it. I created a little fall scene and then added a little yellow stickles to the hill representing the rising sun - I love the papers that are in this Pebbles Seen and Noted (6x6) paper pad! 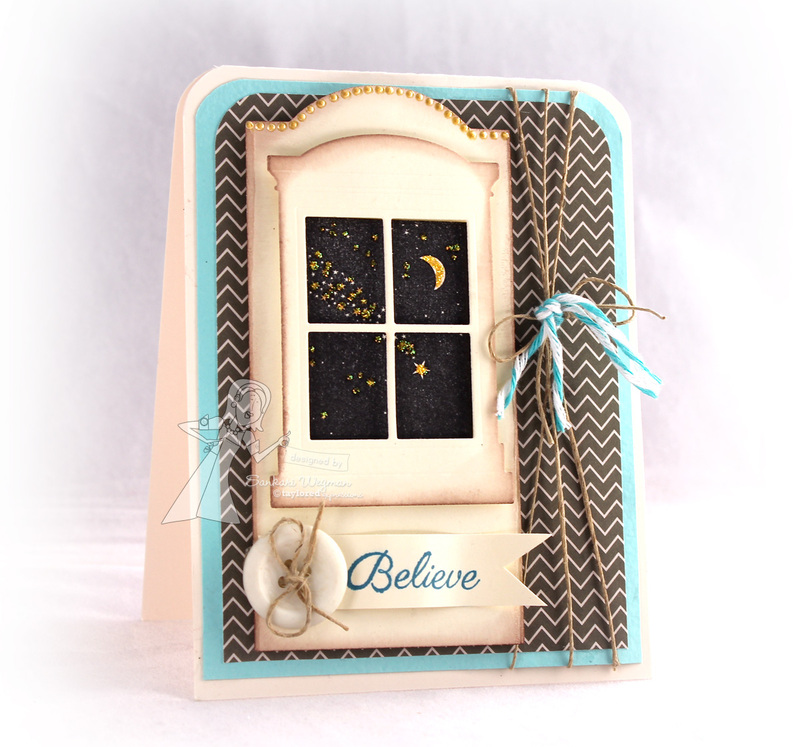 I can't wait to see all the gorgeous creations that this amazing DT has created - please hop along with me and check out these wonderful creations!! 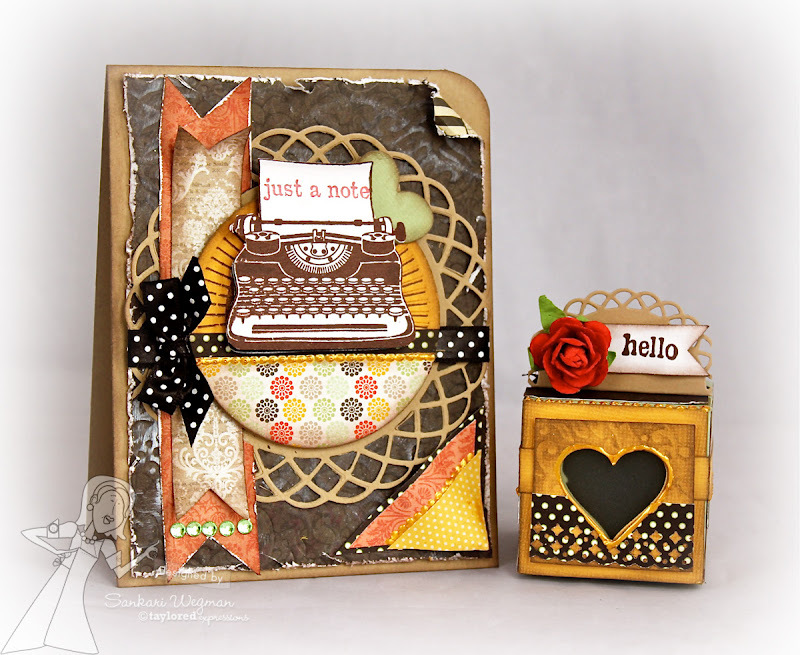 This is such a gorgeous stamp set - it makes it so easy to create vintage-y cards and projects and I love the font in this set - so much fun! Accessories: Flutterbys dies and Open Scallop border from Taylored Expressions, corner punch, dimensionals, bling and twine. Welcome to our Diva Inspirations Hop! It's the 5th of the month and that means it's time for the Verve Inspirations Team to breathe new life into some much-loved stamps and dies. 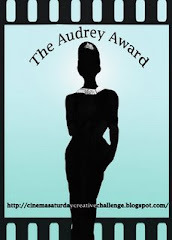 And there's a PRIZE up for grabs! 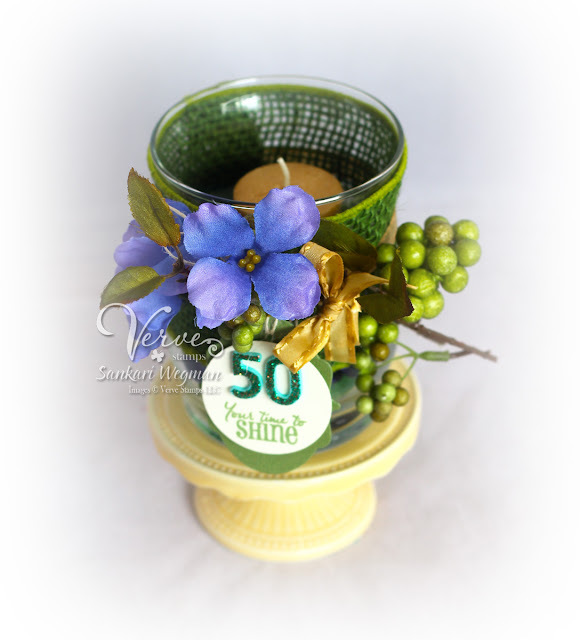 So be sure to leave a little shout out in the comment section of each blog as you hop about to be entered in a drawing for a $30 gift certificate to Verve Stamps! Check out all the details over at the Verve Blog, which just happens to be the start of the hop. I love the Inspiration hops - and this month we are welcoming a whole lot of new Verve Divas for their first Inspiration Hop!!! Woohooo! Welcome Ladies! 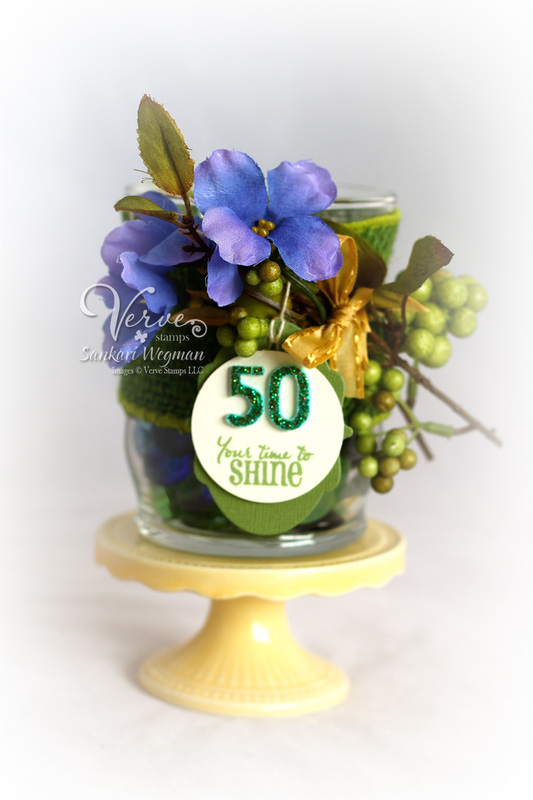 For my project today, I made some table centerpieces for my friends 50th birthday using the Let It Shine stamp set. 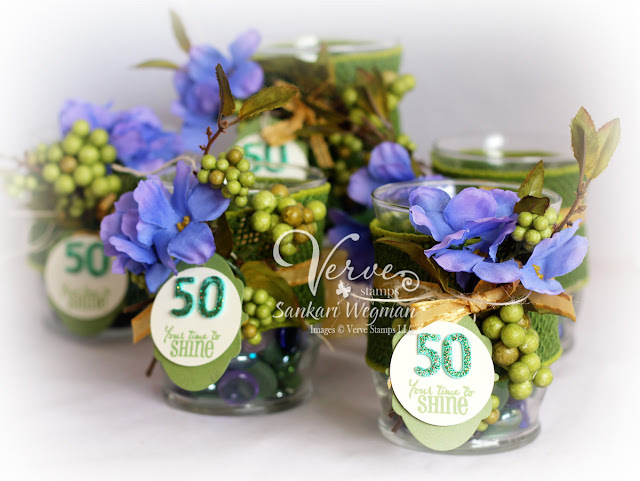 We had a long table set up for her 50th birthday and I thought it would make it more special to personalize the table decorations with little candle holders decorated with her favorite colors (green, blue and purple) with a little tag that says: 50, Your Time to Shine!